Lightweight with a secure closure ensures the shoe stays on and protects the foot. 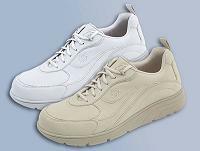 Dr. Zen Therapeutic Shoes have the extra depth to accommodate a diabetic insole. The result is a very comfortable shoe which is easy to put on. The design also helps in the prevention of skin breakdown and other foot problems. Available in White, Beige, and Black. Available in Black, White and Beige. Also available in extra wide opening. A quality trainer for the diabetic foot on the move. The shoe is constructed with a breathable, flexigle full grain leather upper with a completely seamless interior with soft padding and breathable pique fabric interior. Lining fabric wicks away moisture and minimizes heat build-up. Features extra depth, a wide toe box and conoured last. The padded heel collar reduces heel slippage and provides comfort. 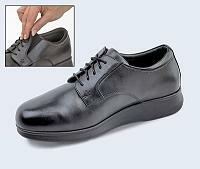 Easy one-hand closure gives the appearance of a traditional lace up shoe. Lightweight, non-skid rubber sole gives flexibility and non-slip traction. Includes a premium tri-layer removable insole that retains the compression set and adds cushioning and can be removed to accommodate custom orthotics. Color: White. Specifically lasted in sizes for either Men (R10) or Women (R50) Size according to US shoe size. A stylish, lightweight oxford shoe, perfect for casual or dress wear. The shoe is constructed with a quality top grain leather upper with a full fabric upper lining to wick away moisture and minimize heat build-up. Features extra depth, a wide toe box, wide padded tongue, and contoured last. The padded heel collar reduces heel slippage and provides comfort. The traditional lace rubber sole provides increased traction. Inclusdes a premium tri-layer removable insole that retains the compression set and adds cushioning and can be removed to accommodate custiom orthotics. Half sizes available. Colors: Black, Chestnut Brown. Size according to US Shoe Size. Comfortable stretch fabric shoe is ideal for a variety of foot conditions besides diabetes, such as arthritis, bunions, and hammertoes. The shoe is constructed of comfortable, breathable stretch fabric with a completely seamless interior with soft padding and breathable pique fabric interior. Features extra depth, a wide toe box, contoured last, and wide padded tongue with wide opening. The padded heel collar reduces heel slippage and provides comfort. Easy one-hand closure gives the appearance of a traditional lace-up shoe. Lightweight, non-skid rubber sole gives increased traction. Includes a premium tri-layer removable insole that retains the compression set and adds cushioning and can be removed to accommodate custom orthotics. Half sizes available. Colors: Taupe or Black. Specifically lasted in sizes for either Men (R15) or Women (R55). Size according to US shoe size. Timeless classic oxford style with therapeutic benefits. 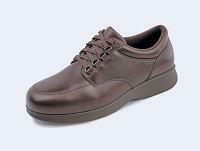 The shoe is constructed of fine dress leather with a full leather lining for increased comfort and breathability. Interior is completely seamless. Features extra depth, a wide toe box, wide padded tongue with wide opening, and contoured last. Easy one hand closure gives the appearance of a traditional lace closure. Lightweight, non-skid rubber sole provides increased traction. Includes a premium tri-layer removable insole that retains the compression set and adds cushioning and can be removed to accommodate custom orthotics. Half sizes available. Colors: Black, Chestnut Brown. Size according to US shoe size. 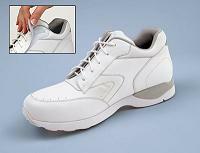 A stylsh activity/walking shoe for those on-the-go. The shoe is constructed with a fine leather upper and a completely seamless interior with a soft terry lining. Features extra depth, a wide toe box, a wide tongue with wide opening, and a contoured last. 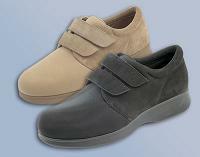 The narrow, padded heel cradle reduces heel slippage and provides comfort. Non-skid rubber sole provides increased traction. Low profile, lightweight shoe. Includes a premium tri-layer removable insole that retains the compression set, adds cushioning and can be removed to accommodate custom orthotics. Half sizes available. Colors: Taupe or White. Size according to US shoe size. All day comfort with a classic look is ideal for casual or dress. 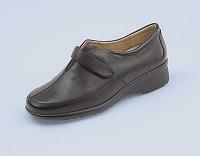 The shoe is constructed with a leather upper and flexible sole for excellent comfort. Interior is completely seamless and fully leather lined. Features extra depth, a wide toe box, a wide padded tongue with wide opening, and a contoured last. The narrow heel cradle reduces heel slippage and provides comfort. Lightweight, non-skid rubber sole provides increased traction. Includes a premium tri-layer removable insole that retains the compression set and adds cushioning and can be removed to accommodate custom orthotics. Half sizes available. Colors: Black, Taupe, or White. Size according to US shoe size. Note - Sizing runs large in width; size down one width. Sophisticated, ladies dress walking shoe with a Euro Dress Style. The shoe is constructed with a leather upper and a completely seamless interior is fully leather lined. Features extra depth, a wide toe box, and a contoured last. The narrow heel cradle reduces heel slippage and provides comfort. Shoe has an adjustable comfort closure and elastic gore front. Lightweight, non-skid polyurethane sole provides increased traction. Elevated heel height has steel shank for increased stability. Includes a premium tri-layer, leather-lined insole that retains the compression set, adds cushioning and can be removed to accommodate custom orthotics. Half sizes available. Color: Black. Size according to US shoe size. Note - Sizing runs small in length; size up half size. Ensure to cinch the strap comfortably snug. Available in Black, Taupe, Brown, and Blue.